US claims that Russia hacked official emails, without evidence, are “indecent”, the Kremlin has said. “They need to either stop talking about this or finally present some sort of proof,” Russian President Vladimir Putin’s spokesman said. “We need to take action and we will,” he told US public radio network NPR. Republican President-elect Donald Trump has also dismissed the claim as “ridiculous” and politically motivated. On Thursday, a White House spokesman said President Vladimir Putin was involved in the cyber-attacks. 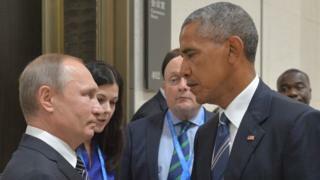 Hours later, Mr Obama said: “I think there’s no doubt that when any foreign government tries to impact on the integrity of our elections, that we need to take action and we will, at a time and a place of our own choosing. “Some of it may be explicit and publicised. Some of it may not be. The CIA has concluded that Russia’s motivation was to sway the election in favour of Mr Trump, but no evidence has been made public. On Thursday, John Podesta, whose emails were hacked as headed Mrs Clinton’s campaign in October and November, criticised the FBI’s response to the alleged Russian hacking. “Comparing the FBI’s massive response to the overblown email scandal [over Mrs Clinton’s use of a private email server] with the seemingly lackadaisical response to the very real Russian plot to subvert a national election shows that something is deeply broken at the FBI,” he wrote in an opinion piece in the Washington Post. What was in the hacked emails? More than 19,000 internal Democratic National Committee emails, published by WikiLeaks on 22 July, appeared to show party officials tried to thwart the campaign of Mrs Clinton’s rival, Bernie Sanders. Also on Thursday, a security firm said a Russian-speaking hacker had penetrated systems at the US agency which certifies voting systems . In early December, the hacker tried to sell more than 100 login credentials from the US Election Assistance Commission, the firm Recorded Future said. The company said its researchers discovered the breach when monitoring underground electronic markets, and posed as a potential buyer to engage the hacker in conversation, before alerting law enforcement agencies. He has also long expressed admiration for Mr Putin, and his pick for secretary of state – oil tycoon Rex Tillerson, who has worked closely with the Russian leader – has raised concerns. Democrats have struggled to grasp why Hillary Clinton lost. Could it be the spread of “fake news”? A poor Democratic ground game in Midwestern states? FBI Director James Comey’s last-minute letter to Congress about new Clinton emails? Russian government hackers are the latest culprit – or scapegoat, depending on one’s perspective. A wily Vladimir Putin overseeing damaging leaks makes for a deliciously villainous plot. Of course those campaign emails, while certainly an annoyance to Democrats, likely weren’t enough to tilt the election. But that doesn’t mean these revelations won’t be a headache for a president-elect who bristles when challenged. Now he’s feuding with his own intelligence services and lashing out on Twitter, virtually guaranteeing more leaks. A congressional investigation seems likely. There’s even talk of a Russian sanctions bill ending up on President Trump’s desk.